In 2005, I became involved with a British guy. Involved seems to be the right term, reflecting back on it. Unspecific and indeterminate. We’d met because he had been coupled with a friend of mine. We’d chitter away at each other. We’d talked around their breakup. He was, to some extent, my friend, but I didn’t think about him very much. Then he offered to bring me some Irn Bru. I don’t remember how I first heard about Irn Bru. It had something to do with SS, that’s all I really remember. JV was into it. Somehow I got some, tried it, and became attached to this bright orange soda. I probably loved it because it was impossible to get in America and I liked being difficult. I drank Brainwash and Jolt. My heart jumps at the mention of Moxie. I don’t actually like soda, I dislike the feeling of the bubbles, but endlessly I get excited about these seemingly hard-to-get drinks. 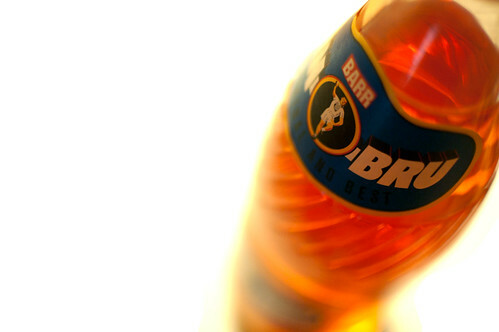 The Brit’s offer of Irn Bru was received warmly and ended up being the starting point of our (brief) affair. It was also the second omiyage someone gave me. Omiyage is one of the Japanese words for souvenir. According to the teachers I had, omiyage are souvenirs with some implication about being specific to the place you visit. The idea that I got is that they are something the area is known for–e.g. Hershey, PA and chocolate. This is specific to something the region makes, not just something evocative of the region–e.g. the Eiffel Tower and Paris. I guess it doesn’t really count as a souvenir if the person is from the area, but it felt that way to me. It was a special thing I couldn’t get at home. At some point in time it became such that you could get Irn Bru in America with the advent of the internet. I’ve never done this because of the aforementioned not actually liking soda. Something about Irn Bru coming from far away makes it special. My parents were the ones who taught me that food makes places special. They might not have set out to do this, but it’s what happened. My parents always enjoyed trying different foods and eating out, so trips had a tendency to highlight what made an area culinarily special. Certain things we’d only ever eat when we were at other places–Klondike bars belong to Florida heat and my grandparent’s chest freezer. These were all personal experiences. I knew I could go buy a klondike bar anywhere, I just never did. I was first introduced to the differences in snacks and junk back in middle school, when I mailed a box of oreos and a bottle of Snapple to New Zealand. A friend of mine there knew how much junk food varied by country and wanted to try these crazy American sweets we talked about with such high regard. While I was sending Hershey’s to South Africa and Denmark, I was being mailed Kinder Bars and “proper” Cadbury chocolates. This sort of idea carried when I began traveling myself. The first time I left the country, it was to England (I’m not really as much of an Anglophile as I’m letting on). I brought back Jaffa Cakes and Irn Bru. My trip to Eastern Europe involved me returning with poppy seed cakes. 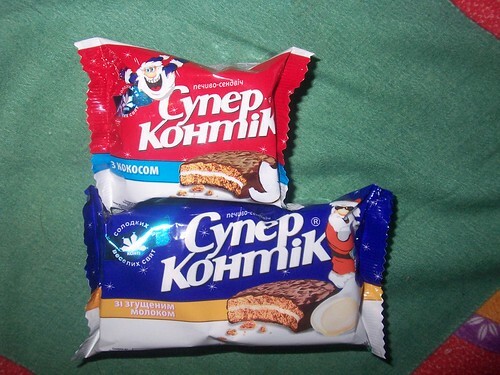 When I left Mongolia, I stuffed handfuls of Super Kontiks into my shoulder bag. Once my dad bought me a box of soft pretzels to take back to university, and more than once I acquired canolis from the Termini Brothers. In Korea, MM’s dad sent him a box with Tastykakes and Peanutchews inside. Visitors from PA regularly bring me Yuengling, and I have, in turn, brought people Yuengling when it was available to me and not them. 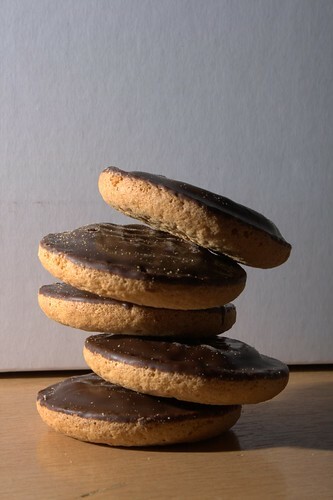 Someone I know always asks for Jaffa Cakes whenever they hear about anyone even being close enough to England to buy some. While real food ties itself to memories and meaning, junk food seems to fit into the food as symbolism in a special way. This has more to do with the consistency of the product–and it’s branding–than the actual quality of the product itself. I prefer Sam Adam’s White Ale over Hoegaarten–which is realistically a better beer. No one makes blueberry pie like D does, truthfully only his blueberry pie fulfills a certain part of me, while every sip of Yuengling drowns me in a sensation of happy memories and melancholy nostalgia. Blueberry pies taste like blueberry pie–unless they’re D’s blueberry pie and then they taste like winter in Pgh. Yuenglings taste like summer and Pennsylvania and the smell of grass and porches and the first time I had one with DA when we were sweating and dying our hair. Thinking about blueberry pie is pleasant enough, but since there’s no simple iconic brand, or product, recognition. 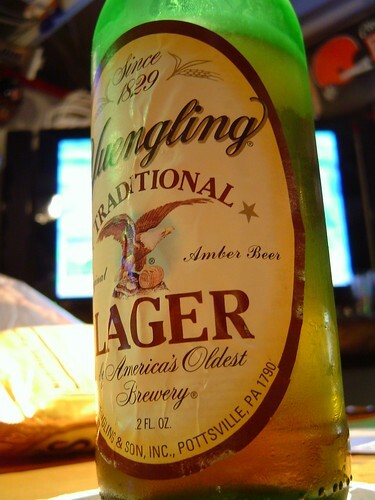 All Yuenglings are the same as the first one I had with DA, and looking at a bottle–or even really just thinking about it–gives me something concrete to latch on to. I don’t know what Irn Bru tastes like. I remember being fifteen and being into weird soda, but Irn Bru doesn’t taste like being fifteen. As a symbol, it really belonged to JV. To him it was about being even younger and trying a drink quite like it with his friends: their sharing an elicit, highly caffeinated, overly sweetened, overly dyed soda. Still, I relish in drinking it—and having a source of it. My newest source of omiyage Irn Bru–they appear periodically over the years as friends coming to America or going on trips to the UK–brought me two 500mL bottles the last time he was in town. I plan on passing one on to JV, so he can find his moment of youth and summer in the sticky orange sweetness. I’ll probably just mix mine with whiskey. Photo one by BentleyCoon, CC-BY-SA. Photo two by ella_marie, CC-BY. Photo three by harunire, CC-BY-NC-SA and exempt from my CC-BY-SA license. Photo four by richardland, CC-BY. Photo five by sonnett, CC-BY-SA. There are things I believe will happen. For some of them, my belief is nestled in things that have happened to other people, to my friends, to my parents, to me. Some of these things I believe are based on statistics and what I know about people in general. A lot of them are based on nothing other than feelings. I believe I will get hit by a car while riding my bike. I believe I will get seriously injured at least once more in my life. I believe some part of my body will be permanently changed in a way that negatively affects my quality of life. I believe I will ride my bicycle up a hill quickly. Some day I will move cities again. At least once. I believe I will be a writer. I won’t just be a person who writes. I will be well loved by my fans and well respected by my peers. Someday a teacher will teach something I wrote. Someday I’ll meet a kid who loves my writing and I’ll tell them something deep and meaningful. I will have a fight with the boy I like. It’ll be a big fight, the kind that involves screaming and yelling and crying and maybe even throwing things. I will storm out. I will curl up on someone’s couch that night where I will cry and cry and cry. I will ask myself what I did with my life that got me to that point and why I did those things. I’ll wonder if this is it and if things are over. I will wonder what I am going to do and who I am going to become. And then things will get better. I will buy a property and live on it. This will not be a perfect place—it will need work. I’ll do this work with my own hands. I’ll ruin things and cry and consider calling someone to fix it, but instead I’ll call my dad and he’ll help me figure it out. He’ll be thinking about retiring and take this as cause to do so. He will let his company run itself and live with me for a month or two or three. We will work on the property together. We will run wires and fix pipes and put up dry wall. He’ll miss my mom and the dog and they’ll come up. My mom will paint the walls bright colors. She’ll take pictures. One day, I’ll find her crying. She’ll hug me and bury her face against my neck. I will push her away and lean my head against her chest. I will hear her heart beat and pretend, just for a few moments, that I am seven again. Someday, I will live near my best friends. We’ll see each other often. They’ll come over for dinner and we’ll go out for coffee. We’ll sit outside and go for walks and talk and talk and talk. I will babysit their children, who will preface my name with “Aunt.” They will wrap their little arms around me and hug my neck. When they’re older, I’ll tell them dangerous stories about their parents that will make them laugh. My friends will scowl and then relent and smile. We’ll drink beer together at their kids’ birthday parties, and every year we’ll wonder how we still get away with it. I will continue to try and do the things I’ve always done, even though my life will no longer resemble what it was at twenty-four. My friends will help me with my children as I helped them with theirs and they will be the ones called Aunt and Uncle. We’ll try harder to not let our kids know we drink beer at their birthday parties. We’ll sneak out for ‘us time’ and pretend we weren’t doing things we were, and say we were doing things we weren’t. We’ll watch the shows we used to watch and listen to music we used to listen to and our kids will shake their heads and call us old and we’ll wonder how we got old. I will get old and my body will change even more. The years I’ve been mean to it will catch up and things will be harder. My skin will become too loose and my tattoos will look funny. I will need to sleep more. I will be slower. I will be mad at myself for these things, but I will push and push and push and keep trying. My knees will hurt and I will get them replaced. I will not look like Helen Mirren, but I will try. I’ll do yoga and swim. I will live to be over a hundred. I will enjoy being over a hundred. I will go to places I’ve never been before and see things I’ve never seen before. I will wonder how I became so old and I will be amazed that there are still so many things I’ve never seen before. That there are so many things I still don’t know. I will wonder if I can ever see or know everything I want to see or know. I will realize that I won’t. I will become okay with this. I will become okay with the idea of dying. > I am not now nor have I ever been a parent. Someday I may be a parent. If I am a parent, I’ll give my kids wacky names like ‘September’ and they’ll hate me for it. I’ll make them trek down to Arizona to visit their grandparents, where they will have to hike in the heat and sun, and watch awful movies with plots like “Were-panda terrorizes small town swim team.” I will make them be vegans–or at the very least vegetarians–and force them into those little seats on the back of a bicycle that would have made me cry when I was younger. I’ll blog about them. One of my coworkers came in late today because she had a family moment. Her daughter found the collection of baby teeth she’d stashed away. Her daughter patted her on the arm and whispered: It’s okay, Mom, I know the Tooth Fairy isn’t real. As the first thread of childhood broke and innocence and -belief- began to unravel, my co-worker (as I imagine it anyway) felt her face go slack as she realized what was happening. Her daughter looked into her eyes like gold and assured her it would be okay, even though my coworker hadn’t said anything. Then she tweeted about it. Assuming that such a thing must exist, I googled for “parenting 2.0” and got 17,300,000 results in 0.17 seconds. The University of Minnesota, I learned, is conducting a study on the ways parents use technology. There are parent blogs. There are communities for all kinds of parenting. In theory, so I am told, back in the day you had kids and you learned how to take care of them either by a) helping to raise your own siblings, b) your parents, c) your neighbors, or d) luck. Now we have this internet thing, and there’s all this -community- and -support- out there. There are people who blog about what happens, people who run Q&As, support sites, and a lot of interaction for parents who are at home, at work, away from their kids, or just about any other circumstance we can conceive of. There are also actual new approaches to parenting. Parenting 2.0. It’s not just about tweeting what your kid does, but it’s about interacting with them through the internet. Google Chrome gave us this advert video that gives an example of creating a digital archive, replacing the baby book in a private way. One of the Mormon housewife blogs I read, without shame!, is a more public account of raising a baby. One of my childhood friends wrote her first online letter to her child. People I call ‘friend’ have been having children since I was somewhere in high school. At this point, they were all older friends. Then people my age(ish) started having children, usually in unpurposeful manners. Only recently did my friends begin to have children on purpose. With two more weddings this summer (one already out of the way), a vast majority of my friends will be partnered legally and not just functionally. With those who have been together for some time turning their talk to children, I have become very aware of the way technology is impacting parenting. With the communities, with the record, with the tweeting. The aforementioned DA, whose child SA just got their first online letter, is creating a permanent, public record of who SA is. This is no longer reserved for celeberity and disaster cases. Much like how anyone can become well known in their own right(2), leaving permanent trails of themselves on the internets, anyone can also do that to their child. When I first googled myself, all that turned up was the guest book post. Then there was my grandfather’s obituary in 2002. My brother’s blog. Then more pages about my brother, with whom I share a last name. Now it’s mostly me. As I slowly do more on the internet, there is more of me spread across it. In ten years, maybe not even, SA will be making their own mark on the internet. In twenty they will be a person on it in their own right, fully formed and completely autonomous. My friends’ children–my theoretical unborn children–will not just be digital natives the way I am, they will be digital creations, digital lives. In spite of what they tell me, I am an immigrant. My childhood has been, in small bits, retroactively added to the internet. I spent my formative years on it, growing, leaving marks, but I was not raised on it. I was not born into it. SA is a digital native. Ivy is a native. Lorelei is a digital native. 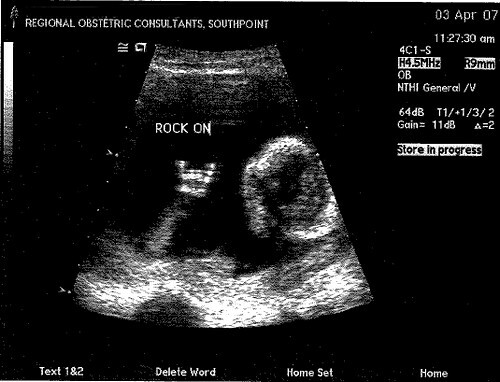 The children whose births we can see online, whose parents blogged about pregnancy and took pictures that they posted as the weeks went by and they grew. Those are the digital natives. And they’ll never be able to escape it. It’ll be as much in their blood as WG says post modernism is in his and mine. It’ll be in their blood the way love is in my mother’s and rebellion is in my father’s. It’ll be something that becomes so inherently a part of them, they don’t notice it was every any different. 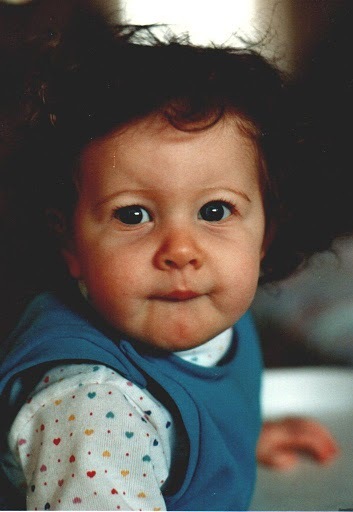 (1) This image is me as a baby. I look more or less the same. (2) I’d like to welcome all hundred of you who show up each week. (3) Photo by Eric Fleming, CC-BY. Periodically I hear this from people. I offer up the URL like a sacrifice, a present, when I meet new people. When I’m going to meet new people. From a deeply psychological perspective, it tells more about me than anything else—how I present things, I how I share things. I like to think that a literature student could take this and make comments about my life and who I am: the mix of egotism and self-deprecation shows that she doesn’t believe herself to be deserving of the praise she believes she receives, but believes that praise to be accurate nonetheless. She is uncomfortable with various aspects of her life, but feels an obligation to share them anyway. She tries to be polite and maintain boundries even when she objectively fails to do so. The fact of the matter is, even while I think my blog posts aren’t great, I think Life on M is good. And that’s always a bad sign. There’s a certain type of egotism in deciding to call yourself a writer. In one sense, there’s an admittance that your ideas, insights, perceptions, or just ways of sharing these things is somehow unique, wonderful, or deserving of notice. I have something so worth sharing that not only will I share it, but that I assume people will read it and ought to pay me for it. For one summer I called myself a writer. It was a struggle that took years and faded away quickly. In applying for a Fulbright—a thing I was denied for those of you following along at home—I had to publically and repeatedly declare I was one. In moving to Somerville, I came under the costume of being a writer. For four glorious months of my life, I did a lot, which included writing. I rode bikes and cooked. I learned and read and watched and changed and researched and wrote and wrote and wrote. In middle school I wrote my first real story. It was about a physicist who created a black hole that was slowly consuming the world. By eighth grade I wrote my first novella, an eighty-five page. It was cleverly titled “Destination: Unknown.” It was about Andromeda Benton, the boarding school attending daughter of the lost adventurer Orion Benton, who got pulled out of her universe into an alternate reality that had been created for the purpose of staging a contest merely known as The Hunt that occurred once a decade. The Hunt was a scavenger hunt, effectively, across what appeared to be the grounds of the school Andy attended. While people put together teams that trained for years, she was accidentally thrust into it, a solo adventurer who just wanted to get out. It was dangerous. People died and got lost and there was magic inherent in the universe that changed the Hunt. There was a story that followed it that I only wrote half of. That summer, 2001, I also wrote a play about someone dying of Hep C. I was a morbid fourteen year old. I justified to her why it actually fit the assignment, but she and I both knew I was reaching. I got that response a lot in school—I didn’t follow the assignment. Instead, I would write these sprawling pieces as loosely tied to what I had to do as possible. In high school I came up with Major Arcanna, and have been tweaking and revising bits of her as time has gone on. The first six issues are written up, undrawn. Anatomy of a Revolution was a graphic novel I penned my first year at university about a post-second-revolution America and the political nonsense that occurs when revolutionaries try to run a country. It starred Zwei, a former revolutionary turned politician who was tired and aging. In chapter one he is betrayed by his wife, who was a rising star in the former regime. When the wife goes on the run, V goes after her. Only known as Valkyrie, V is the body guard/right hand man/confidant/former best friend of Zwei. There were dull moments of people talking about politics, and lots of flashbacks and broken story telling. At university I wrote a play as I struggled with defining myself as an academic and not a scientist, as I had once hoped to be. I started writing Reinventing Mary Jane, which was a comic about Mallory Jameson, who became the girlfriend of the young superhero Fireproof. The comic was ditched for a novel that became Against the World, staring Liz Peirson and Max Romero which still sits, lacking a climax. I wrote a novel and a screenplay that was my coming to terms with the inevitable breakup between the Artist and myself. They’re a pair, telling the same story in two different forms. Shortly after that, I plugged out a nameless screen play that was just another love story, picking up on a trend I’d been following in which endings don’t exist. I always liked the end of it, where the two leads lay in bed together holding hands, looking at each other. She says “This is pretty good, isn’t it?” and he says “Yeah,” before they jump out of bed to take care of their child—the implication being that this moment picked as the end was merely a breath mark in the story of their relationship. In Korea I wrote two screenplays, All’s Fair that was renamed as “Things Other People Say About You and Me” that was then scrapped and turned into something else entirely, resulting in, I guess, two screenplays with similar plots and the same characters, but different stories. “Zombie Summer,” which was a coming of age story about a boy who believes in zombies that don’t really exist, was sketched. Once I came back to America, there was my summer of writing about the culture of freedom. I plotted out another comic series which pulls at my mind and begs to be written, but it doesn’t have a single issue yet, just story arcs. I’ve started two novels in the mean time, one serious piece of lovely trash about Evelyn Harris, who has to go save her boyfriend Harlan Locke, and an unnamed piece about the unfortunately named Kalinka Herschoff and her struggle with figuring out who she is. The former strongly reflects on the problems I have with teen romance books, the latter my own struggle to define myself. The former, I recently, realized, begs for a companion piece—something I guess will need to be attacked in book two. In my current project, Evelyn adventures for her boyfriend, and doesn’t do it alone. I find myself needing to consider how people adventure for themselves, and how they do it without having their partner accompanying them. Throughout most of this, I never called myself a writer. I wrote, sure, but I wasn’t a writer. It made me cringe when people would talk about a group that included me and said “As writers, we…” I detail my ten years at taking writing seriously, outlining various projects, mostly for myself to help me remember, but in part because I find it ridiculous how anyone could see this and believe I am a writer. I’ve published nothing: I’ve sent a few short stories out at various times—one I wrote about communism in China, another about baseball, vinegar, divorce, and flying faster than light—but they all came back with rejections. I never sent things out seriously because my shorts weren’t good enough. No one was enthusiastic about putting together films because I find it impossible to write a screen play shorter than an hour. But more than that, it’s been years since I’ve submitted anything, and I was lying to myself when I said that it might be good enough for publication. It wasn’t—and logic tells me it still isn’t. Instead, I sit on my pieces like a miser or a dragon with gold. I chug along and pick pick pick at the trashy novel, waiting until it’s finished enough I send off letters to agents trying to sell it to them. The thing I find most absurd about my fear driven reality is that I want to be a writer. I’m not one now, but some day, I tell myself, I will be one. Some day someone will read one of the things I’ve written, think it’s good enough, and give me a contract that I sign, thereby making it so I am, officially, a writer. And I really think it will happen. This whole bundle of emotions and thoughts, racing towards a land of fantasy, is lined on a path that makes me not just slightly uncomfortable, but more than a little nauseous when I think about it. My fight against calling myself a writer, is powered by all of the self-professed artists, musicians, and writers I’ve met who produce nothing, sell nothing, and share nothing. The ones who are bad. I don’t want to be this person, who calls themselves a writer but never makes a sale. I don’t want it to come out that, in truth, I’m not very good. I don’t want to spend years of my life trying to be something that I’m just not going to be. I am not a writer: I write. I am not a knitter, or a biker, or a baker, cook, researcher, musician, educator. 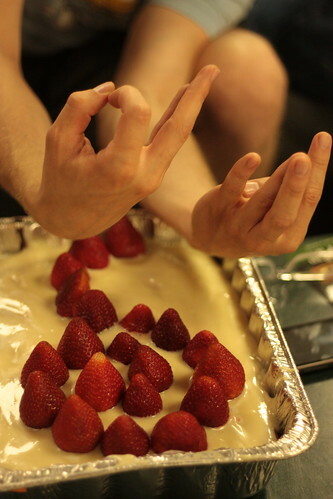 I am a person who knits, bikes, bakes, cooks, researches, plays music, and teaches. I think of it this way not because I am a person with many facets who refuses to be held down to a single one, but because I am not as into or as good at any of these things as people I know who identify by them. In living in a world where I can “be anything,” being something is hard. Over the weekend, a friend of a friend was in town. He asked me about why I moved out of Philadelphia, if I still think it’s so great. I told him that if I hadn’t left when I did, I never would have. I told him that leaving was important to me, because I wanted to be something else than what I had been: I wanted to be a writer. I like to say that one way to get someone to care about something, is to have them care about someone who cares about it. Even though Bikes Not Bombs is the place everyone I know talks about when it comes to buying a bike, very few of them actually care about it in a way that would draw them to action. Except for IR. She’s the reason I care about Bikes Not Bombs, and in order to talk about it, I need to talk about her. IR met AL and came over our house a few times during this awkward period of some new friendships where you, or at least your friends, wonder if it’s going to be more than just a friendship and the two parties involved see quite a bit of one another. She didn’t feel quite like a real person those first times I saw her. A short girl hailing from St. Petersburg, IR was nearly impossible to actually talk to and demonstrated one of the strangest senses of humor I’ve ever seen in a person—a literal translation of Russian word play into English with little room for any other window dressing. Every word out of her mouth tied to another in a linguistic trick that left me doubled over. She told me about when she was younger–like a kid younger–and met the daughter of one of her parents’ friends. That girl, she said, was the most amazing person to little IR. She was beautiful and brilliant and interesting and when she said she was going to go to Boston, little IR realized that it too must be beautiful and brilliant and interesting and vowed to go there one day. Eleven years later IR seemed to provide herself as my first real proof that a member of our little lost generation can have a home that they were not born into. She’s more a part of the city than other people I know who are vocal about their love of it. She’s involved in the community. She’s involved in biking. The first time IR talked about biking, I was a little surprised. Russian women, they joke, have two phases of life: when they are tall and thin and gorgeous and when they are short, plump babushkas. She skirted past the first phase. Rather than moving in that begrudging way archetypical babushkas move—resentful of their bodies for shrinking their vertical ways and growing in their horizontal ones—she motors around with the same sense you see in their younger counterparts. 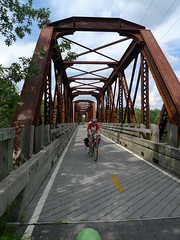 All of the bike people I’d met, to that point, had been slick ropey people, all sinew, skin, and dense, wiry muscles. IR didn’t -look- like the other people I knew who went on long, endless bike rides. When a boy I foolishly liked inspired in me the idea that it would be good to bike out to North Adams to go to an art museum, she countered with a proposal involving staying at the house of a flower farmer and getting a ride with him back to Boston on Tuesday. “It’s really the best way to go there and back,” she said. IR, you see, is a bike master, but she’s thoroughly unpretentious about it. One day we watched someone on a robin’s egg blue single speed brush by us. She sighed at them and said “That’s a shame, that bike frame is not a good frame.” She didn’t sound like she was making fun of the rider, more that she felt sorry they didn’t have a better bike. She knocks out sixty mile trips as though they’re nothing. She knows more about bikes than most of the people I know–and the people I know know a lot about bikes. When she asked if I wanted to go to BNB for a tour, something she nervously broached and then quickly added that they weren’t going to ask me for money, I said of course. In spite of how many people I know swear various forms of allegiance to BNB, I’d never been there. It was early on a Saturday morning when I first went to BNB. We’d both been up late the night before, so AL and I were suffering to stay awake as we made our way over there with IR and a friend of hers, EM. We sat around a table with a bunch of other sleepy people, poking at muffins and coffee. We shared stories about what bikes mean to us and about us riding bikes. We all felt a little emotional when the tour actually began. The tour wasn’t just of their physical work space, a converted industrial space that feels one part science museum with its colored, grated walks, one part work shop, and one part home. We did make our way around the Hub, as they call it, and see the different parts of it, but mostly we were given a tour of their programs and philosophy. We were told about people in the Earn A Bike program, both in the general sense and specific stories. We learned about the girl whose parents hit her. The boy whose cousin was shot in an act of gang violence, and how he didn’t do anything about it because he was asked not to by the people at Bikes Not Bombs. The essence of stories about the people in Earn A Bike and Girls in Action–a girl specific Earn A Bike program that also focuses on things like female empowerment–is that if you teach anyone how to do something, they form a better sense of self. Movies like Wasteland, that chronicles the work artist Vik Muniz did with catadores in Jardim Gramacho, and Born Into Brothels, which focuses on photography done by the children of prostitutes in Calcutta, focus on art as the medium of this change. But, in truth, we learn that giving anyone–younger people or older people–an activity and a community of members who respect them and who they can respect in return, will have similar results. In some cases it’s art of music. Mad Hot Ballroom, one of my personal favorite documentaries in this genre, is about a ballroom dance program in the New York City Public school system. During the film, we get to see how one of the students goes from assuming he is going to die before he’s an adult to having plans to become a dance instructor. Sports are a classical example of people forming a strong sense of sense and a sense of belonging—especially with team sports. The 2005 documentary Murder ball mostly proves to us that even U.S. cripples are totally badass. However, there’s a scene in which a depressed young veteran is dealing with his combat driven amputation and he is introduced to the idea of wheel chair rugby. He is sitting in the Mad Max style wheel chair and, gleefully, bumping it into things as he realizes for the first time that his whole life isn’t ruined. There’s still paraplegic rugby. There are lots of flavors for this kind of empowerment. There’s rowing programs and sailing programs. Science and music and math and art. People dance and play games. there are so many programs, initiatives, and projects—so many good ones. At university, I spent some time holed up ignoring all organizational pleas for help because there were just too many of them and I didn’t know who to give my attention to. I just felt –bad- that they were asking for money and I had none and I thought they were all good. For some reason, after hearing about the youth work at BNB, I found myself thoroughly emotionally devoted to the cause. I structured a practical reason later—that bikes are longer lasting. This isn’t just about creating a sense of belonging or community or feeling good, it’s not literally about saving lives on a scale beyond the occasional individuals: it’s about sustainability—a word we love to toss around. When you fix a bike up, you know how to fix a bike. You can fix other people’s bikes; you can fix y our own bike. When you have a bike, you have a means of transportation (and joy) that you just need yourself to make go. If you can fix that bike, you don’t need anyone else for it. Completely and totally, it’s yours. Having something that really is yours, especially when you’re younger, is rare. BNB doesn’t just give youth a renewed sense of self, it gives them a thing they can take away from it and share. But that all came later. I was driven by the tear wrenching stories and my own deep emotional attachment to my bike (the artifact and the concept.) I was unable to remove myself from everything I got out of it and wishing very deeply that everyone else could have that too. There’s more than just that. There are the International programs where people go places and help other people. It files the same idea of sustainability and creation—not just throwing money at problems, but giving people tools to help themselves. Ability Bikes is a bike shop run by “disabled” bike mechanics in Koforidua, Ghana. The people there share the same stories of finding self-respect—and a way to support themselves—through bikes. Maya Pedal doesn’t try to get gas or electric powered machines to function as water pumps or corn mills in Central America, instead it creates human-powered bicycle based machines to carry out these tasks. They’re not as quick as their otherwise powered brethren, but they will work even if you run out of oil or the power goes down. Bicycles are beautiful machines. They are, ultimately, simple, even though we dress them up in fancy ways. They work, even though no one seems to quite be sure why. They are powerful and amazing, not just because of what they are physically, but because of what they can be or mean to people. Bikes are happiness, power, independence, freedom, joy, fun, hobbies, toys, objects of fascination, friendship, ecologically friends, inspiring, transportation, love, and so many other things I can’t think of them all right now. And that’s why I am riding in the Bikes Not Bombs Bike-A-Thon.